maemo.org - Planet maemo: category "feed:c9cc24540e35350893859da24a38c99b"
Today is the last day of 2011 and it is once again when people look back in time and realize what they have done throughout the year and if they stuck to their promises. I don’t give that much importance to events like new year’s eve or even my birthday but I decided to write a blog post and to think about what happened on 2011. 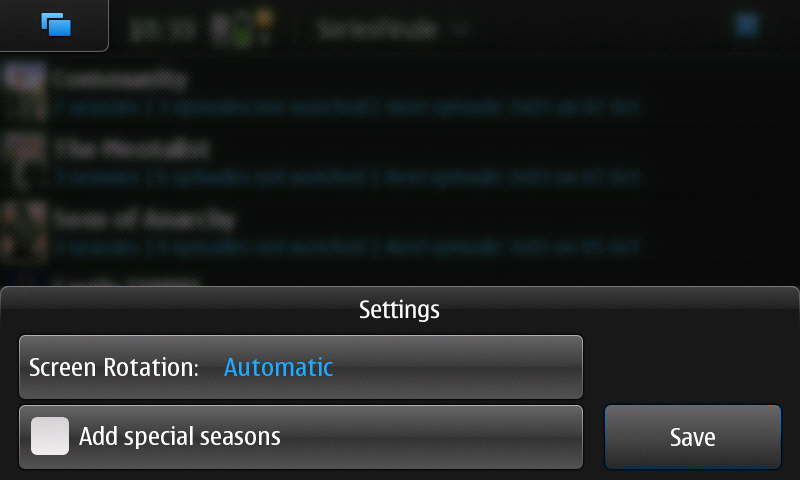 As promised before, here is the first release of SeriesFinale for MeeGo Harmattan. Yesterday was a holiday so I got some time to hack a bit in SeriesFinale. 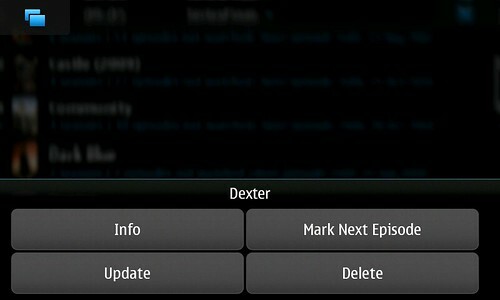 One of the things I wanted to do was to have a context menu for shows and seasons. Something to apply individual actions like deleting, updating, viewing information, etc when there is a long press on a tree view’s item. Finally I could get a little time to finish SF 0.6.8 release. Anyway, the live search is fixed in this new version. Since last version, it is possible to navigate to the next and previous episodes when viewing an episode details but one thing that was a real pain was to have to go back to the full list of episodes in order to mark them as watched so I’ve added a menu that lets users check the episode as watched. If you use the extras-testing repository, be sure to give it a try and vote to promote it. 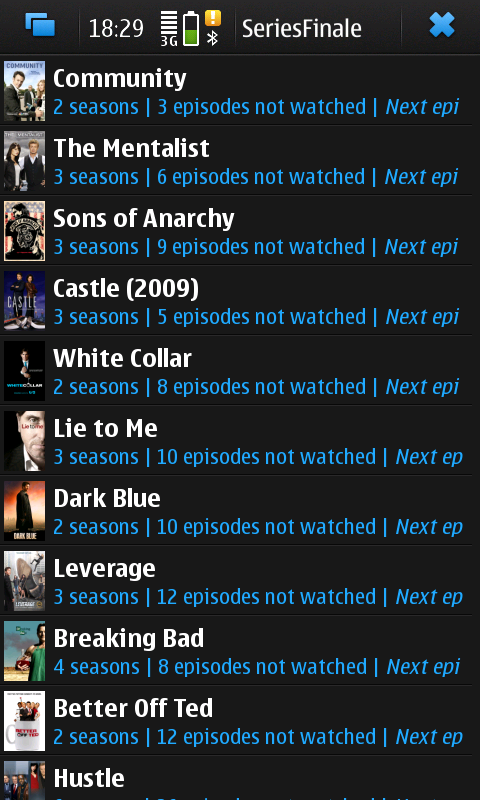 Since last night, SeriesFinale version 0.6.6 should be available for those who have the extras-devel catalog. * Live search of shows. Finally it includes a way to quickly filter shows, this is especially useful for those who have a large number of shows in the list. * Quick access to the next/previous episodes. 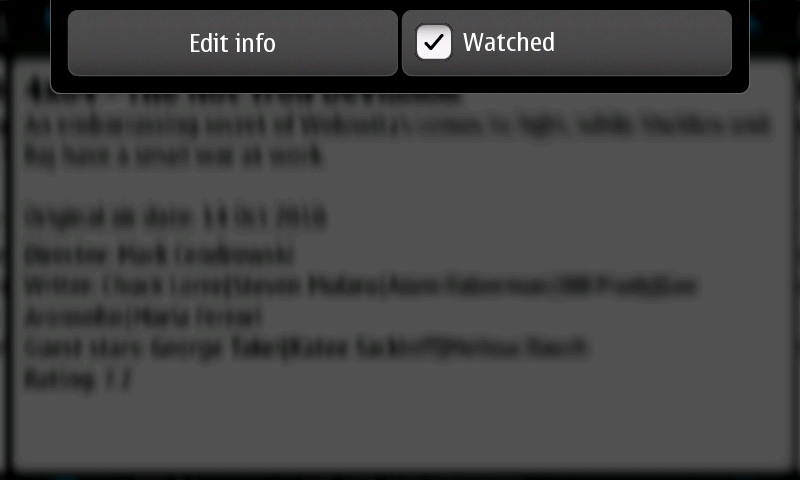 This was another request from a user, when viewing an episode, add a way to quickly go to the previous or next episode. I have added this by panning/dragging horizontally in the episode view, dragging left or right will bring the next or the previous episode, respectively. * Switched episodes’ “watched” check-boxes to the right. 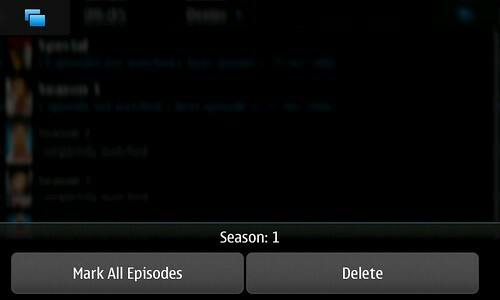 After adding the portrait mode, it was clear that having the episodes’ check-boxes on the right made more sense for right-handed people. This is now the default position, nevertheless, a new option was included in the settings dialog so users can choose to either have on the right or left. * Last but not least, Juan has made SF more reliable and fast by saving the database and settings only if they have been changed. We will keep the list of bugs and feature requests in mind for the SF development (for both Maemo and GNOME) so, you are welcome to submit more. If you use the extras-testing catalog, be sure to try this new version of SF and vote for it when it appears here. 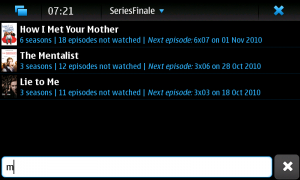 As promised in some of my previous posts about SeriesFinale, I have finally ported it to GNOME. For the ones who don’t know about this pet project of mine, SeriesFinale is a TV shows browser and tracker application that was originally developed for Maemo Fremantle. While I use it all the time in my N900, I have been asked to port it to GNOME and I also thought it’d be a good thing to have it in my favorite desktop. If you find some bugs, you can file them in the Maemo Bugzilla for now (be sure to specify the platform). Let’s see if we come up with some sort of synchronization for SF in the future so you don’t have to be marking your episodes twice. For now, if you want to start with the SF information you had on your N900, just copy the series.db file under “~/.osso/seriesfinale” in Maemo to “~/.seriesfinale” in GNOME. SeriesFinale for GNOME from Joaquim Rocha on Vimeo. Hope you enjoy SF on GNOME! The last SeriesFinale version was released before I went to GUADEC and then on vacation which means that it’s been a while since you have had news from this nice little app but today I’m releasing its 0.6.5 version. This version has some nice new features apart from regular bug fixing and code improvement. Juan has added the portrait mode (borrowed from the great gPodder) which surely pleases many users. 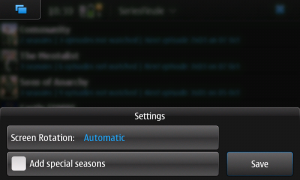 Sometimes I get sick of getting the “Special” season on every shows, basically because I never watch those; so, I added a check button to the settings dialog where one can tell if the special seasons are to be considered or ignored, when adding new shows or updating existing ones. 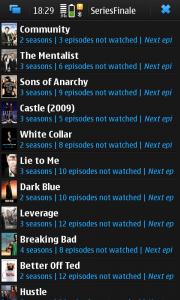 But, if you’re like me and have a bunch of shows already added, it’d be a pain to delete episode-by-episode from the Special seasons in every show in order to delete these seasons… To solve this and to fill a missing/neglected action, I’ve added the “Delete Seasons” view which makes it easy to delete seasons. Some problems with the threads have been solved as well, so, maybe weird issues like missing shows’ full title and stuff will likely be solved after this version. 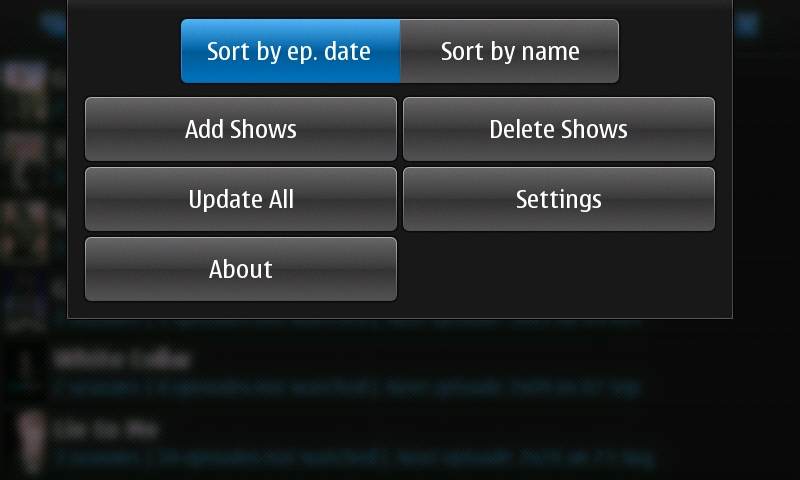 Finally, a feature that has been requested a few times has been added: list shows by recent episode date. This means that now there are two filters in the shows’ view that list the shows by most recent episodes or by name. This is really useful because selecting the recent episodes’ sorting you can now update your shows’ list and the ones that got already aired, unwatched episodes will be listed on top of the list. Soon, in a Maemo Extras repository near you! 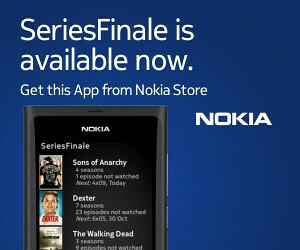 It’s been a while now since I released the last version of SeriesFinale. The truth is that I’ve been busier than usual these days and of course, this is reflected on pet projects. As some of you may have experienced, there was a kind of a nasty bug in SeriesFinale’s last version: it wouldn’t update certain shows (when they had been added long ago)… and the good news is that this is one of the things that got fixed in this new version. One of the good things Juan introduced for this version is how the next episodes to be watched are shown. Before, the episodes were shown according to their “first aired” date and in case of the same date for two or more episodes, the highest index one would be marked as the one to be watched. In this 0.6.1 version, the episodes are shown according to their number and season, so, if episode #3 has the same air date as episode #4, #3 will always be shown as the next one to be watched. It is now using a priority queue to download the series’ covers and info that gives priority to the info. This means you won’t have to wait for the info AND covers to download when you hit the Update All menu but instead wait only for the info; the covers will then be downloaded in the background while you use the app normally. I’m now introducing the new Russian translation, which Misha Ketslah had kindly sent to me a while ago but that I hadn’t had the time to integrate. So… what about that GNOME version, you ask? I’ve already started to port it to GNOME but couldn’t dedicate much time to it and taking into account that I’ll be on vacation very soon, it’s likely it will take a little longer. 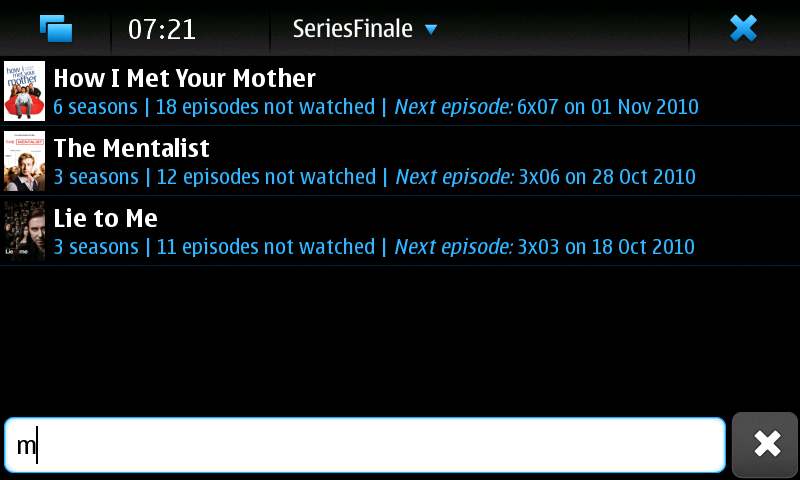 But I’m looking forward to use SeriesFinale on GNOME! As for the N900 owners, I’ve just promoted the package to Extras-Testing so either use the Extras-Devel repo as usual or wait ~10 days for it to appear in Extras.